One of the most intimate of human experiences is our intersection with nature, with the planet and its generosity to give life. In this confluence between human nature and nature, we truly are one. The forest, the cultivated garden each covets their own secrets. Some are revealed upon inspection; some never to be seen by humanity’s intervention. But the noticed can and does incite a verbal and silent dance that inspires our curiosity with nature. Even the misshapen begs for attention. Inner monologues become vocal dialogues. Tree sleuthing had become a recent avocation. My mission is to capture winter’s minimalistic exhibition of those often overlooked parts of the overstory and understory: the tale of the tree with its immense contribution to our survival. I’ve immersed in experimentation and the results are black-and-white photomontages that reflect the bare wonder of wintry landscapes. The season spreads its variable lows, icy and snowy conditions, still the bare tree is the sensation, showing artistic forms and shapes that are unseen much of the year. With climate change uncertainty looms cloud-like over how the season will reflect the past, the present and the future. Still, I find gratitude in each season, even winter that chills my bones. The simplicity of Japanese aesthetic melts my sensibilities. Their simple eloquence inspires quiet consideration. My gardens are filled with rock and stone, and some of the arrangements have been influenced by Zen gardens. If you are inclined toward this kind horticulture or style, please read this article about these extraordinary gardens that are minimalistic within precise artistic elements. It’s titled “10 Garden Ideas to Steal from Japanese Zen Masters (by Michelle Slatall and published online 05 February 2018)” is worth the read. This entry was posted in Black-and-White Photography, Digital Art, Mobile Photography, Nature, Nature Photography, Photography, Photomontage, Writing and tagged Black-and-White Photography, Digital Art, Mobile Photography, Nature, Nature Photography, Photography, Photomontage, Trees, Writing. Bookmark the permalink. This is one beautiful image! What an eye. 🙂 Yes, sometimes it’s all about getting down to the essence, and you have some that so beautifully here, without sacrificing any of the complexity. I’m humbled. You’ve brought a huge smile across the day. Thanks. Stunning photo, Sally. Your editing skills have really amplified since my last visit. Love the link to the Japanese zen gardens too. Especially as I have only recently returned from Japan during their crimson leaves season. Their gardens exude calmness and serenity the minute you walk through the gate. Lovely to hear from you. How fortunate that you were able to have experienced the beauty of their cuisine, culture, history and society. And of course meet the people. I think you would like it. Have you ever been over that way? No, but I have wanted to travel there. Sally, you would get some amazing photos. I cannot encourage you strongly enough to plan a trip. I would suggest going in the crimson leaves season if you can Nov- Dec, as the cherry blossom season is so very brief. I will be posting some more photos of my recent trip and the stunning gardens I found soon on my blog. Will visit you soon to see your images. Thanks. That is a gorgeous photo. I really like the blend between negative and positive. And the pattern comes out as something ethereal. Otto, your response brings such joy to my day. I truly appreciate your comment. I’m deeply touched by your response. Thank you so much. A beautiful black and white photomontage, Sally! And as always, I like and agree with you “pen” part. Trees are essential for everyone’s existence on this planet. I do thank and touch them on many of my nature walks. I enjoyed your response, and feel that we share an advocacy for nature. See you soon. Your photograph has quite a graphic look to it. Lovely to hear from you. Thanks. I love how this shot highlights negative and positive space. Lovely, Sally. I’ll take a look at the article too. I’m sure you’re dreaming of spring right now! Patti, thanks and see you soon. Yes, I am planning and dreaming about it. Just ordered some seeds. I haven’t been here in a while….saw a comment you left on Otto’s site and clicked over to find this fantastic image. It is really, really wonderful. Thank you for your response to my image, and thanks for your visit. I like the interplay of light and dark in your photo. The composition works well as a distillation of winter’s chill. Quite a stark photo which conveys your mission perfectly. The shape of the trees is a key element. I love your gorgeous photograph. Isabel, I appreciate your comment and visit. Thanks. I love this B&W series, Sally. The cross-lighting and up-lighting effects of your edit elevate the image to another level to experience, one that I find to be “beyond a photograph.” It is more along the lines of a wood-cut for me. Allan, I truly appreciate your response. I’m humbled. I can only agree with Tish and Sue. Wonderful image. I kept staring at these trees, and wonder what if a few branches of the darker tree would extend a little more… Hard to tell without seeing it. I am just wondering. Helen, no birds were in the images, just your marvelous imagination. Thanks for your response. See you soon. Enjoy the week. Sally, May I ask a question? When I tried photomerge in PhotoShop, I kept getting “Some images could not be automatically aligned”, what does it mean? Those were same size photos. I am a little confused. I cannot help you with Photoshop. I do not use it. 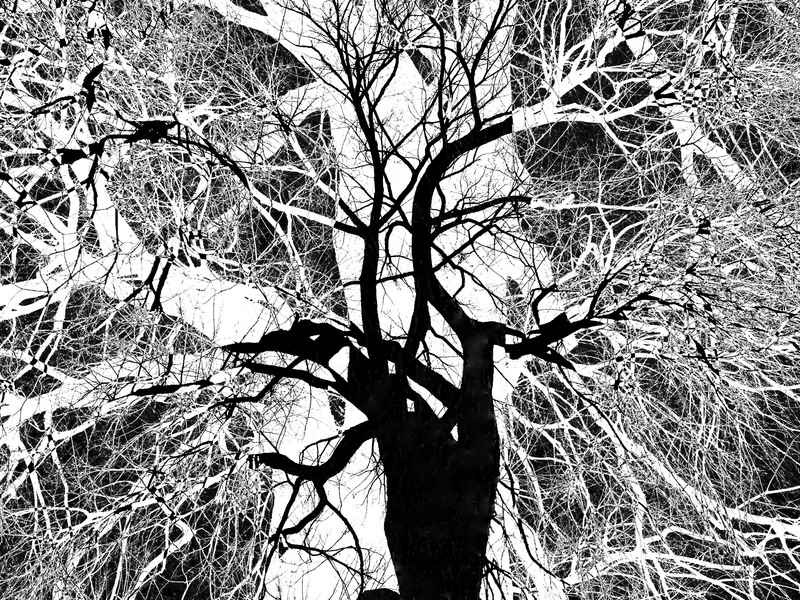 Love your tree image – a beautifully composed graphic, I love the contrasts. Sue, lovely to hear from you. I appreciate your response. It’s a time to contemplate the spring garden. Thanks. Well I think your tree sleuthing mission has more than paid off with this image, Sally. It’s stark in tone, yet also suggests great vitality (of fresh life to come) in the busily arcing branches. Tish, thank you for your response, you’ve brought pure sunlight into a cloudy day. See you soon.